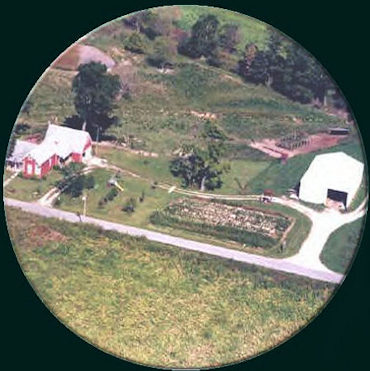 Welcome to Albert and Diane Armand's farm, located in rural Westport, Indiana. We raise 400+ acres of corn, soybeans and wheat. We also have a 140 sow farrow to finish hog operation along with a cow-calf operation. Back in the 1940's, Albert's grandfather raised tomatoes for the local canning factory. His family has always been interested in big gardening. Since there are no canning factories locally he has concentrated on a bigger variety of produce items. 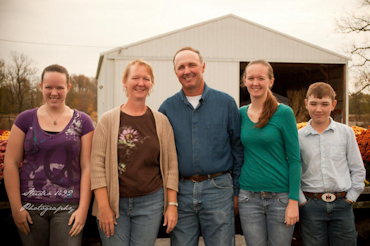 Farming in the Westport, Indiana area since 1941, the Armand's have been providing custom farming service starting with threshing and shredding in the 1940's to combining, picking, square baling in the 1950's to combining, round baling and no-tilling crops today. The Armand's put an emphasis on balancing environmental concerns with profitable modern practices. No-till and residue management play key roles in preventing water pollution for the Armand's while maintaining high yields and profits. Livestock is utilized to add value to raw grain crops and animal wastes are used to replace a portion of our commercial fertilizer. By waiting for weeds to emerge, the Armand's can often use lower rates or safer herbicides to control weed problems. We believe by combining the best new practices, we can maintain high yields while having a positive impact on the environment. We strive to use cover crops after low residue crops to prevent erosion and capture any nutrients left over from the last crop. Cover crops also build organic matter capturing carbon (a greenhouse gas) and nutrients from manure application. 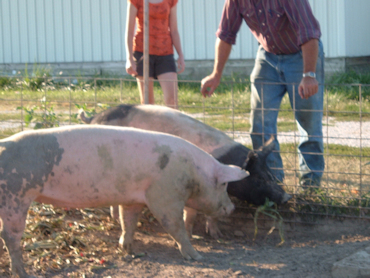 Our livestock operation also utilizes a mix of old and new. Cattle are pasture fed with supplemental feeding in the winter and in times of short grass supply. Finishing calves destined for slaughter are fed high grain diets to ensure tender beef. The hog operation combines lot breeding where sows have room to exercise and roam and straw bedded housing with confined farrowing and finishing. 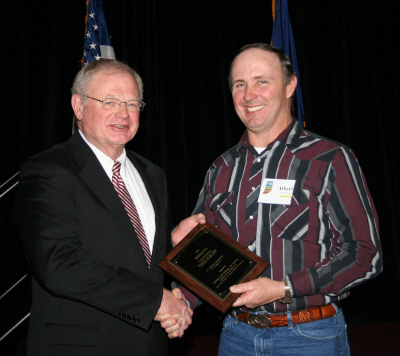 This helps maintain healthy, happy hogs and efficient gain and use of land. We also have a small laying flock to provide eggs for the farm. These chickens have access to pasture at all times and give the farm the feel of the past, plus provide eggs for sale. The crop portion of the farm has utilized no-till production on all crops for several years. No-till methods reduce soil erosion and reduce labor & equipment requirements. No-till farming also increases organic matter, soil quality and water holding capacity, helping crops in time of heat and drought stress. When properly managed, no-till farming maintains or increases yields and enhances wildlife habitat. During the summer, we grow delicious sweet corn, tomatoes and other produce. We sell this at our home and Greensburg, Columbus City & Downtown Columbus Farmers Markets to Jennings Co. In the fall we invite everyone to come join us in the pumpkin patch. Visitors can wander through 8 acres along with garden mums and other fall decor along with a variety of pumpkins or gourds.. Picked pumpkins are also available for the rainy days. 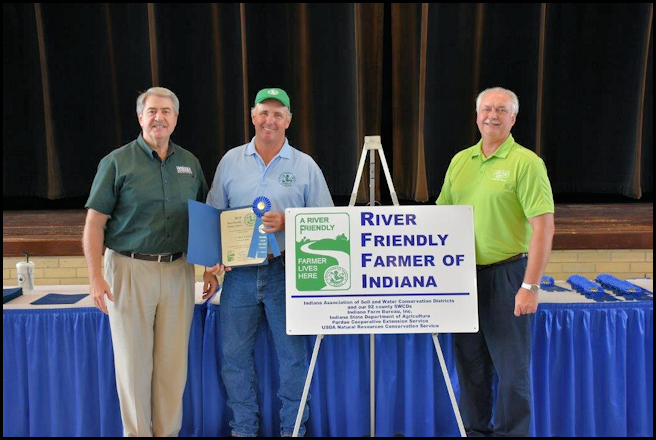 Albert Armand received the 2016 River-Friendly Farmer Award for Decatur County on Aug. 17th at the Indiana State Fair. 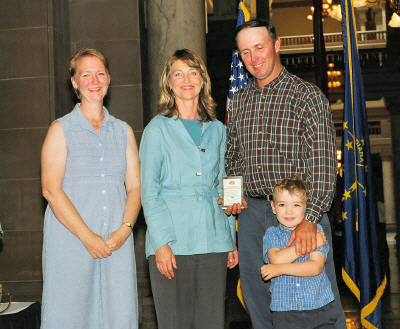 This is in recognition of his outstanding best management practices on the farm that conserve and protect Indiana soil and water resources. 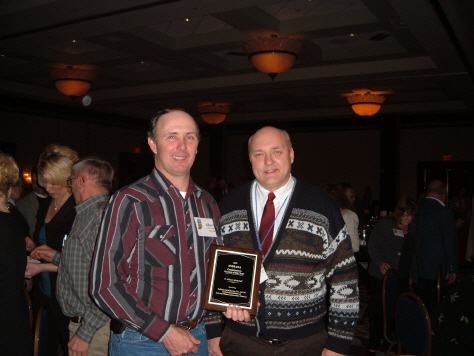 Winner of the 2007 Conservation Farmer of the Year Award by Indiana Farm Bureau! and women from across the state to receive a 2004 Lieutenant Governor’s Hoosier Hospitality Award! FRESH BEEF AND PORK FOR SALE! BE SURE TO Check out our fresh Beef and Pork! The Locker will custom cut to your order. CUT DOWN ON YOUR CaRBON FOOTPRINT - ORDER DIRECTLY FROM THE FARM AND EXPERIENCE FRESHNESS STRAIGHT FROM OUR FARM TO YOUR TABLE!